LAS CRUCES - “We continue to have only two glass recycling drop-off points in Las Cruces, but the tonnage of glass bottles and jars being dropped off has doubled from 2014 to 2015,” said Tarkeysha Burton, recycling coordinator for the South Central Solid Waste Authority. Every month in 2014, residents dropped off eight to nine tons of glass bottles and jars; in 2015 the tonnage rose to an average 19 to 20 tons per month. The result is more crushed glass available free to the community. 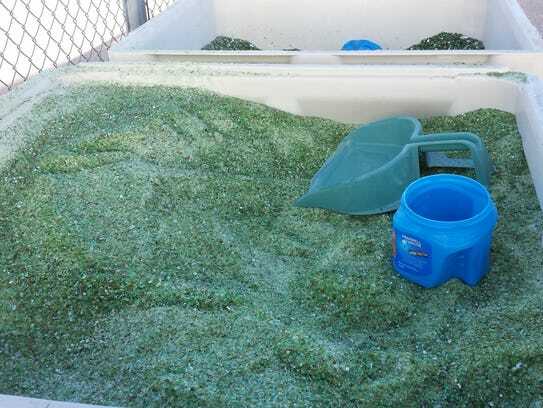 To date, crushed glass is picked up as quickly as it can be placed in the SCSWA Recycling Center. Residents who have been disappointed to find the glass gone when they got there, or who have not been able to get the color they wanted, are invited to try again. The glass “cullet” can be picked up at the SCSWA Recycling Center, 2855 W. Amador Ave. The center is open seven days a week from 7 a.m. to 5 p.m. Monday through Friday, and 8 a.m. to 4 p.m. on weekends. The second drop-off location for glass is the recycling yard at the Old Foothills Landfill — open 24 hours a day — at 555 S. Sonoma Ranch Blvd. Burton also reminds everyone: Labels are not a problem, but please remove bottle tops and corks, and please separate glass by color when dropping it off, so the crushed glass product offered back free to the community maintains its integrity and its true color. These non-recyclable types of glass that can ruin the entire hopper of crushed glass.